Brachyorrhos wallacei Murphy, Mumpuni, de Lang, Gower, and Sanders, 2012a: 510. Holotype: BJE0 1059. Type locality: Jailolo, Halmahera, Indonesia. 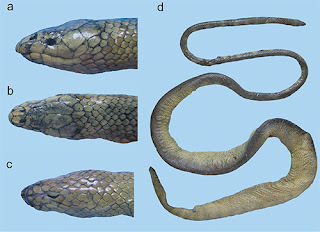 Distribution: Halmahera, Indonesia (Murphy et al. 2012a). Diagnosis: A fangless homalopsid. Usually lacks preocular, usually seven (rarely six) upper labials, tallest is sixth (rarely fifth). 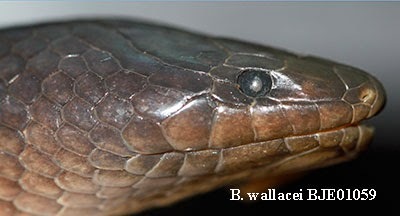 This snake is quite similar to B. raffrayi which has upper labial three in the orbit and the third is the tallest. Specimens of wallacei usually have the fourth upper labial (rarely 3+4) in the orbit, and the fifth is the tallest. Mitochondrial DNA data show that B. raffrayi and B. wallacei are separated by a deep molecular divergence despite their morphological similarity (Murphy et al., 2012a). Snakes are the most creepiesta s well as the most interesting specie. I have always been very anxious to research about snakes and their various kinds. Finally found a blog where i get all the interesting details. I simply hate snakes. They arise an emotion of fear and creepiness whenever I have a look at them. However, your blog is interesting to know more about them. I can do a complete essay writingon the snakes now.